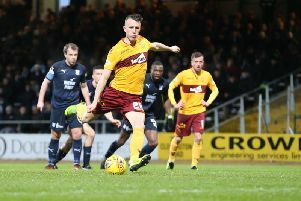 Stevie Hammell produced a man-of-the-match display in his long awaited comeback from injury for Motherwell in Saturday’s draw against Ross County. The experienced left back (33) was blameless as County’s Liam Boyce shot home a 40th minute goal to earn the visitors a crucial point after Scott McDonald’s close range 19th minute opener for the Steelmen. “It was good to get back,” Stevie said. “It feels like I’ve missed pretty much the whole season. “I thought we were probably the better team, but it was all about getting three points and we didn’t do that. “It was disappointing we didn’t build on the good start we had. “It was a good goal from their point of view but we could have stopped it. The 1-1 draw means second bottom Motherwell trail both Ross County and Kilmarnock by six points with just three games remaining. ’Well welcome Kilmarnock to Fir Park tonight and anything less wil leave them a virtual certainty to enter a two-legged play-off to retain their Premiership status against Hibs, Rangers or Queen of the South. Stevie added: “It’s three good teams. Whoever finds themselves playing against them will need to be at the top of their game.